The Choir of St George’s Chapel Windsor Castle Conducted by Timothy Byram-Wigfield are to give 3 concert performances in December 2010, commencing with Handel’s MESSIAH on 8th & 9th December at 7.30pm (doors open 6.30pm). The orchestral accompaniment for these performances will be Charivari Agréable the Oxford based Baroque orchestra with an International reputation. Soprano soloist will be Ana-Maria Rincon and all other solos will be performed by members of the Choir. The performance will last approximately 2 hours and 20 minutes and there will be an interval. 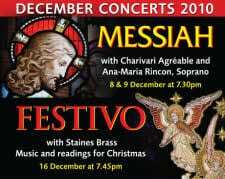 On 16th December at 7.45pm (doors open 6.45pm) St George’s Choir will be joined by Staines Brass, the locally based twenty five piece Championship band, for the popular Christmas concert we call FESTIVO – an evening of seasonal music and readings. The programme will end at approximately 9.15pm and will run without interval. This popular way to begin the evening offers a glass of hot mulled wine or non alcoholic equivalent with hot and cold canapés and warm mince pies. Tickets are £12.50 each (no concessions) with only 90 places available. All profits go to support the College’s musical foundation, the Choral Partnership. In addition this year, for the first time, the Royal Windsor Information Centre at the Old Booking Hall, Central Station, are participating in the sale of tickets. If you wish to use credit or debit cards please follow the link to the Information Centre’s website <click here> or call them on 01753 743900. Internet and telephone bookings through the Royal Windsor Information Centre are charged at £1.50 per transaction.